Rita, Pedro and their two daughters live in the Sintra area, close to the cost of Portugal, where the Summers are rather hot and dry and the Winters cold and rainy. It never get’s below cero but the constant humidity and low temperatures during the winter months creep into your bones. 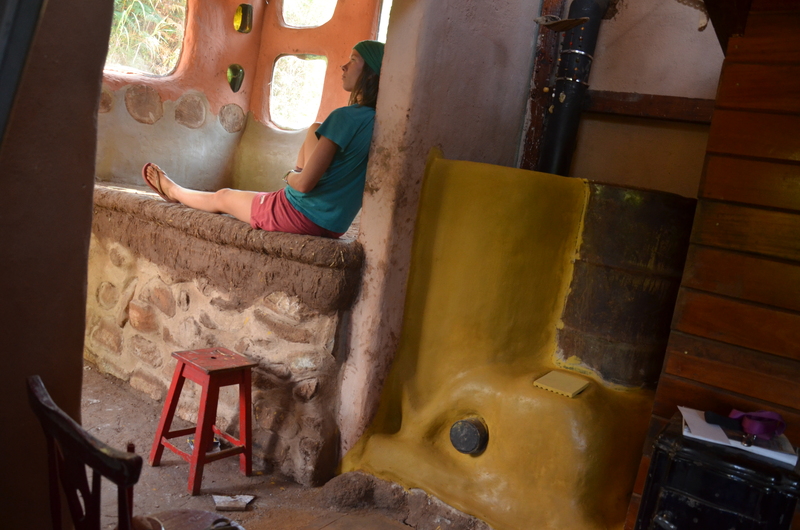 One part of their house is made out of earthen materials, the other half is made of wood. In the earthen part of the house, which also has a little loft on top where the children play and sleep, they used to have a wood stove. The experience was that it radiated a lot of heat while the fire was going and even felt too hot in the upper part of the room, whereas the lower part stayed cold. Cob for thermal inertia. To achieve a more stable temperature throughout the day and night, the family decided to take the regular stove out and replace it with a rocket mass heater. In this design, the combustion follows the principles of efficient wood burning stoves (see below and Aprovecho Research). Rocket Mass Heaters make use of the hot air gases by channeling it through pipes that are embedded in a bed or bench made of cob before leaving the house through the chimney. Cob has excellent thermal mass properties. It slowly takes on heat and releases it once the surrounding temperature is going down. The bed is basically a thermal mass battery that helps to achieve a constant temperature at a comfortable level. This resistance to drastic fluctuations in temperature is referred to as thermal inertia. The combustion chamber also allows for that immediate heat since the fire burns like a rocket and lot’s of energy is released at the beginning. After getting details for the design and implementation ready, the participants arrived. Most of them already had some experience with Permaculture and Natural Building and it was a really great group to build and have fun with! Since the back of the house was built into the hillside, we elevated the bed so it didn’t have that “cavy” feeling. We built a stone wall to contain the bed and then filled it up with rocks and gravel until we achieved the desired height, which was about one meter. Lot’s of cob mixing followed and Pedro joined the party with his didgeridoo and the drums. Thanks Dina, Livia, Sophia, Inés, Drew, Joao, Samuel, Andy, Jayne, Angelica, Sergio and all the others that dropped in for parts of it, for your enthusiasm and eagerness to learn and put your hands in the mud! We built the combustion chamber and the elevated bed in pretty much two days of full-on work! This allowed us to take it easy the next day, when we built the 16-brick rocket stove for cooking. To sum it up: in Rocket Stoves for cooking it is all about efficient heat transfer from the fire into the pot. In Rocket Mass Heaters it is all about making good use of the hot air by tubing it through thermal mass that get’s heated up and later releases the warmth. Both designs follow the principles of efficient wood burning. Ever since I have started my Permaculture and Natural Building journey, I loved the community aspect of it. That’s what drives me. And also because I like clay, and I because I like doing things myself. but mainly because of people. I don’t like building by myself and I rarely do that. And so it is with teaching and facilitating courses, work-parties or working with volunteers. I do believe that working in a team is enriching for both facilitators and participants. In the last months I have started to facilitate short workshops and courses, assist the lead teacher and shared the leadership role with other people. What I have enjoyed the most was the shared leadership role with people that have a similar level of experience. Besides working with Josh, I had another enriching experience during the Village Building Convergence in Portland, Oregon, where I co-facilitated a place-making site together with two other woman natural builders. There is no hierarchy and no boss, but a lot of exchange, confidence in one another and mutual support! This entry was posted in Appropiate Technology, Courses, Natural Building, Portugal, Rocket Stoves, Terra Alta, Uncategorized. Bookmark the permalink. ← Welcome to Building Connections!